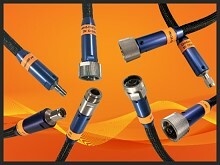 ConductRF Ruggedized VNA Cables to Replace the Tired and Worn! We have many standards for applications at 18 GHz, 27 GHz and 40 GHz. Precision Ruggedized VNA Cables from ConductRF offer RF Engineers great alternatives to costly OEM cables that are now past their best days. Our torque resistant connector heads and phase stable constructions ensure great performance for many tests to come. With options for 18 GHz, 26.5 GHz, & 40 GHz, these cables offer cost leading alternatives to original OEM VNA cable solutions. ConductRF VNA series provides customers with reliable ruggedized solutions for Lab and Production Vector Network Analyzer testing. These cables are phase stable during flexing and have an operating life cycle of up to 5,000 matings when correctly operated and maintained. VNA Series cables are enhanced with a stainless steel spiral armor, providing protection from excess bending and crushing forces. A black nonconductive outer cover completes the product. Connector options available for male and female interfaces include; 2.4mm, 2.92mm, 3.5mm, SMA and Type-N series. NMD head options that mate to VNA port connectors are available for additional stability for female interfaces in 2.4mm, 2.92mm, and 3.5mm series. 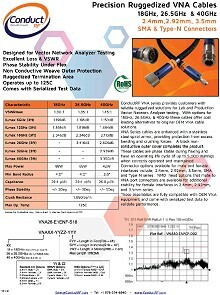 These assemblies are fully compatible with OEM VNA equipment and come with serialized test data to validate performance.